Root canal treatments are an essential part of dental care — countless teeth with deep decay would be lost each year without it. Now, this traditional dental care procedure is advancing to a new level of precision through lasers. 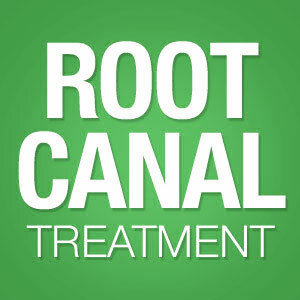 Root canal treatments have a simple goal: access a tooth's infected pulp and root canals, clean out the infected tissue and fill the empty pulp chamber and canals with a special filling. Once filled, the access is sealed and a porcelain crown later placed for additional protection against re-infection. In the traditional procedure, we perform these steps manually with a dental drill and hand instruments. We may also need to remove a good portion of tooth structure, both healthy and infected tissue. A laser, on the other hand, is a highly focused beam of light with the ability to interact with healthy and infected tissues differently: destroying infected tissue while having no effect on nearby healthy tissue. The end result: we may be able to remove less healthy tissue with lasers than with the conventional procedure. Lasers are also helpful with softening and precisely molding the filling material within each canal's particular shape. And, early reports seem to indicate a higher degree of comfort for patients (less drill noise and need for anesthesia), less bleeding and faster recovery times than the conventional approach. 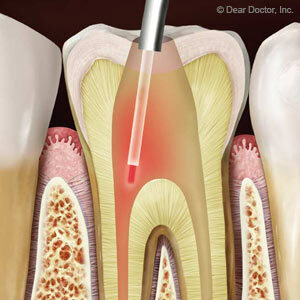 But as a tool for root canal treatments, lasers do have a couple of disadvantages. While light travels in a straight line, root canals are rarely straight — conventional instruments with curved designs usually accommodate odd canal shapes better than a laser. Lasers can also raise temperatures within a tooth that can damage healthy tissue, both within the pulp and outward into the dentin. Still, lasers for root canal treatments appear promising with some dentists using a combination of lasers and manual techniques to garner benefits from both approaches. While you won't see lasers replacing the traditional root canal treatment anytime soon, the future looks bright for more efficient ways to treat deep tooth decay. If you would like more information on your options for root canal therapy, please contact us or schedule an appointment for a consultation.